Have you ever written an e-mail or a blog post, saved it but ... it didn't save? Yeah, well this is what happened with this one. So, I'm back writing this post for the second time. A while back I posted that I was working on memorizing some Scripture. I had several people ask me how I go about that and I'm happy to share what I know. I think memorizing Scripture is a key to our walk with Christ. I'm going to break this up into a two post blog series. One will be today and the other will be on January 27th next Monday. Today's topic will be why you should memorize Scripture. I think if we realize the value and importance of it we will be more apt to hide God's Word in our heart. II Timothy 3:16 - All Scripture is given by inspiration of God, and is profitable for doctrine, for reproof, for correction for instruction in righteousness. Lately, I've noticed a big trend of everyone focusing on "God is only love". By all means, yes that is true but when you look into The Word it isn't always going to be the 'warm fuzzy love feelings'. Notice in what ways the verse says Scripture is profitable: for doctrine (knowing the truth of the Bible, for reproof (conviction), for correction (don't we all love a big correction? ), for instruction in righteousness. I don't know about you but those sound like difficult things. However, to live holy and in close fellowship with God we need those things. That's why it's profitable. Psalm 119:35 - Make me to go in the path of thy commandments; for therein do I delight. In Matthew 4 the temptations of Christ. Jesus was led into the wilderness where Satan tempted him. Guess what Jesus answered back with? "It is written, man shall not live by bread alone but by every word that proceedeth out of the mouth of God". He didn't use his powers to kill of Satan (although He could have) but He used the Word of God. If He used it how much more do we need to use it? That isn't the only thing about chapter 4 that needs to be noticed. If you keep reading (and I highly recommend you read Matthew 4 for yourself) you will notice that in verse 6 someone else used The Bible, he even quoted it, hmmm ... that would be Satan. Isn't that kind of scary? Satan used Scripture to tempt Jesus? My husband recently told me of a sermon where it talked about how people use the Bible to condone and justify sin but he said we shouldn't be surprised because Satan has been doing that all along. If Satan is going to use the Bible against us we better get to studying and memorizing so we can rightfully discern it. Psalm 119:11 - They Word have I hid in my heart, that I might not sin against thee. Bottom line - the Bible keeps us from sinning. I can remember arguing with my husband about a board game (yeah, we sometimes do that...) and I just had to prove my point. You know what I heard softly in my heart ... "Be swift to hear, slow to speak, slow to wrath". It was the book of James I memorized last year and although my flesh did not want to hear that I'm so glad God told me to be quiet. Romans 12:2 - And be not conformed to this world: but be ye transformed by the renewing of your mind, that ye may prove what is that good, and acceptable, and perfect will of God. If you are looking to change something in your life spiritually it starts in your mind. If you get the Word of God in your mind it will eventually get into your heart and transform your life. That's why God tells us to think on 'whatsoever is true, lovely....". Your mind is a big battlefield and to win it you gotta put truth in it. What about you? 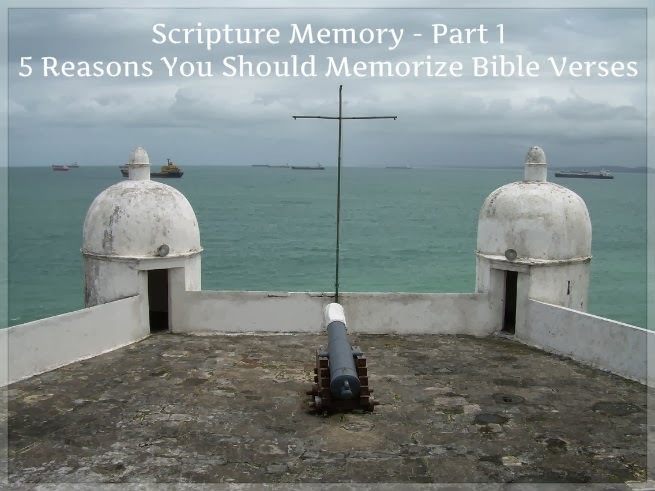 Do you memorize Scripture? Is there anything that could be added to this list? i agree so much with every single bit of this!! i love that God gave us His Word for instruction, encouragement, a weapon, etc. it really is a living word! All good points. I know I'm not as good about actually memorizing Scripture as I should be. I'm still trying to make it a habit to read it every day. Looking forward to the next post! I needed to read this. I know I need to be more disciplined in reading Scripture, but I don't always think about why it's so important. It's our sword, and we can't use it if we don't know it. You are so right, Jenny. It's definitely our sword. I think a lot of times, at least for me, it boils down to discipline. That's the hard part to me. I'll have to look at those apps. Thanks for sharing.